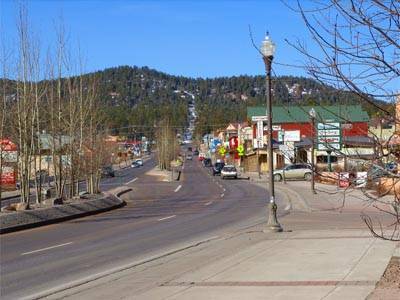 Surrounded by unspoiled wilderness, nestled among one million acres of Pike National Forest is the pristine mountain community of Woodland Park. This small town with charm and friendliness is your perfect mountain hideaway. The natural surroundings include spectacular views of Pikes Peak and Rampart Range, thick stands of spruce, pine and aspen, deep blue skies and fresh air. Centrally located, Woodland Park is your ideal base camp for day trips into the Pikes Peak region. Comfortable summers and mild winters offer year-round outdoor recreation including hiking, backpacking, camping, mountain biking, cycling, horseback riding, cross-country skiing, snowmobiling, snowshoeing and ice skating. Fishing along the South Platte River, Manitou Lake, Rampart Range Reservoir, or Eleven Mile Canyon and Reservoir are all within 25 miles of Woodland Park. Bring your clubs and play our 18-hole championship golf course amid scenic mountain views. Coined "The City Above the Clouds" by long-time resident Cal Elder, Woodland Park often enjoys clear, bright sunny skies!